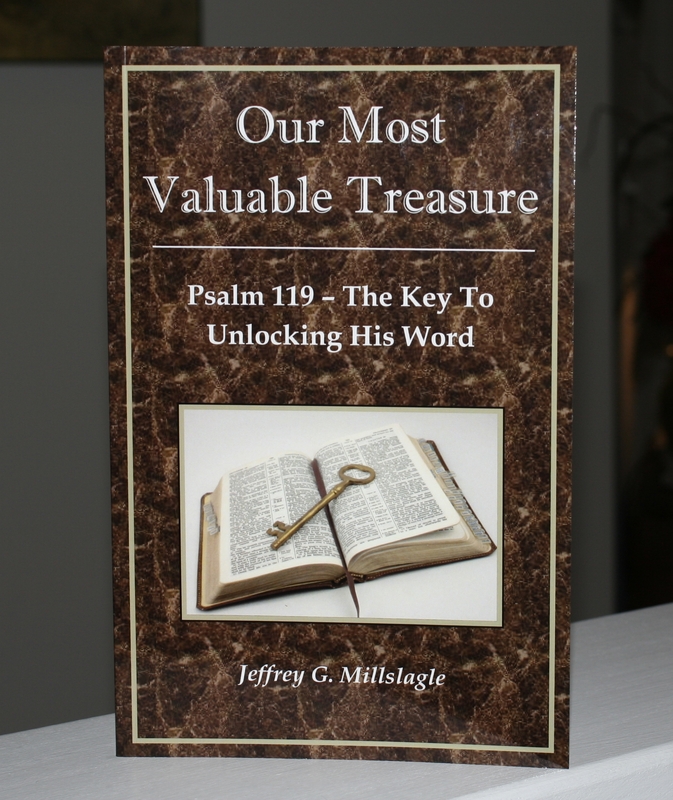 In my book, Our Most Valuable Treasure, I describe 11 concepts of “keys” about understanding the Bible from Psalm 119. This is from chapter 7, “The Key Of Wisdom From The Word” as found in Psalm 119:98-104. We must look at life from a God-centered position and not a self-centered one. This was the essential to David’s success when he faced Goliath. I’m sure you remember the story. It’s so popular that it has even become part of our common vernacular, especially when describing different sports teams where one is substantially less talented than the other. Facing an opponent against overwhelming odds, we’ll refer to the game as a “David and Goliath” match up. But do you really know why David was able to trust God and why he had faith to face the giant? It might be my all-time favorite Bible story. The young man, probably early to mid-teens, is armed with nothing but a handful of rocks. He faces the biggest, baddest dude of the region who is intent on killing young David. The Covenant, as mentioned in Genesis 17 was marked by circumcision. This is My covenant which you shall keep, between Me and you and your descendants after you: Every male child among you shall be circumcised; and you shall be circumcised in the flesh of your foreskins, and it shall be a sign of the covenant between Me and you. Maybe the rest of Saul’s army had forgotten this concept, but not the young shepherd boy. He knew according to Scripture, no “uncircumcised Philistine” was going to wreck God’s plan for Israel if they trusted God and His Word. Most of us look at things from a problem-centered view point and ask, plead, or beg God to do something. We need to confidently face our “giant” knowing we too are His people. So this is a question to ponder. Was David, at this young age, really more intelligent than all the other warriors of Saul’s army or was he just Scripturally wiser? I don’t think his victory had anything to do with intelligence, but it had everything to do with wisdom. Biblical wisdom is only found within His Word; realizing that fact is The Key Of Wisdom From The Word. If we want to have real wisdom and see things from a God-centered viewpoint, we need to be people of His Word. To order your copy of Our Most Valuable Treasure, go to the “book” page or send me an email at jeff@shortbaldguy.com. I am asking $12 for the book and $4 for postage. This entry was posted in Bible Application on June 30, 2016 by The Short Bald Guy. After 52 years of disappointment and embarrassing on-field performances, the City of Cleveland finally had a champion. The city’s professional basketball team, the Cavaliers won the NBA title. Cleveland fans of all sports celebrated this victory. It had been a very long time since the city had a championship in any major sport, and the city celebrated. Over one million people made their way into downtown Cleveland to enjoy this moment. I’m not a fan of any Cleveland sports teams. As an outsider to the revelry, I observed from a distance. I do, however, have many friends that are Cleveland fans and they have suffered under so much last minute disappointments, and poor teams. I have even been known to tell a Cleveland joke. But for a few days after the Cavs win, I stood back and watched Cleveland enjoy the moment. One close friend of mine was telling me how much he was enjoying this and it opened up a train of thought of mine. As happy and euphoric the city was with the Cavalier victory parade and the sea of over one million people celebrating their championship, it was not even a drop in the bucket to what Heaven will be like. One attitude that was erased (if only until the next season) is the sense of disappointment; the feeling of loss and failure. Those situations are forever removed in Heaven. No more death, nor sorrow or crying. No more pain! That sounds exciting to me! While Heaven really is beyond what I can imagine, ever so often we get a little hint as to what it might be like. The celebration Cleveland was able to experience was just a quick minuscule fraction of how awesome Heaven is going to be! Happy, celebratory and lots of friends! In chapter 19 of Revelation we are told of an event called the “Marriage Supper of the Lamb.” I have a feeling that food will be nothing short of delicious. Later in chapter 22, we see how there is “no more curse” and “no night.” This is really an amazing statement about what is promised us in the future. The absence of the curse means no more sin, sickness, disease and death. No more night might indicate no more loneliness or fear or another negative aspect of night. Whatever Heaven is going to be, it will be even better than well-deserved championship parade! So the next time you see a city celebrating a championship and thousands of people enjoying the moment, remember, there is an even bigger and better event awaiting those who have trusted Jesus. No more pain, no sorrow, no tears, no sin, suffering or disappointment and lots of people celebrating the Risen Savior and our eternal relationship with Him. That is a parade you don’t want to miss! This entry was posted in Bible Application on June 26, 2016 by The Short Bald Guy. In Chapter 2 of my book, Our Most Valuable Treasure, I present the Key Of Discipline By The Word. This discipline is important because we are all in a battle. I begin this chapter with a look back to Great Britain during World War II and their determination to fight their enemy. We too, as Christians need to muster the same determination as we wage war against our adversary on a daily basis. The continent of Europe began to fall under Nazi Germany control in 1939. On September 1 of that year, Hitler and his war machine invaded Poland, followed in quick session by Belgium, Norway, and finally France. By the spring of 1940, nearly the entire European continent was under German control and they were threatening to invade England. After the fall of France and the evacuation of over 300,000 British troops from Dunkirk, the future looked bleak for Great Britain. Some of Hitler’s military leaders wanted the Reich to invade Great Britain immediately. Hitler however believed the English government would capitulate with just the mere threat of invasion and seek surrender terms with Germany without any further military persuasion. He did not think the government, nor the people of Great Britain, had the determination to stand up against his totalitarian regime. He couldn’t have been further from the truth. The whole fury and might of the enemy must very soon be turned on us. Hitler knows that he will have to break us in this Island or lose the war. If we can stand up to him, all Europe may be free and the life of the world may move forward into broad, sunlit uplands. In spite of recent British losses, the fall of France, and at the time, the unwillingness of the United States to oppose Hitler, Great Britain was willing to stand alone against their enemy. The attitude, articulated by Churchill to the English people not to submit to Nazi Germany, shaped the entire country’s actions. They were totally committed, as it was necessary for their survival. For the Christian, we face no less a threat. Our enemy isn’t a foreign state or a totalitarian regime. But our adversary, the Devil, does seek “to steal, and to kill, and to destroy” as Jesus told us in John 10:10. Peter calls him a “roaring lion” in 1 Peter 5:8. Paul discusses spiritual warfare in 2 Corinthians 10:3-4 and in Ephesians 6:11-17 he describes the armor of a Christian. Clearly, not unlike England in 1940, we face a substantial enemy who wishes to destroy us. Have you ever considered your Bible as a weapon? Not a weapon used to club someone over the head, but a weapon of the Holy Spirit, used in battle against the worst enemy we will ever face. It is the greatest possession for a Christian, yet too often we are negligent to understand its importance and value. This entry was posted in Bible Application on June 23, 2016 by The Short Bald Guy. Today is the day I officially release my first book. About 3 ½ years ago, I began a personal study of Psalm 119. While I had read through it many times, it wasn’t until January of 2013 that I began to study it in any detail. Beyond a few verses here and there, I had not invested much effort into this chapter of Psalms. Soon however, I began to see some patterns and common themes and I realized there is a wealth of spiritual wisdom in this chapter. I quickly came to the conclusion this chapter can help each of us better understand, believe, and trust the rest of Scripture. I put together some teaching outlines and shared some of those with my small group from church and a men’s Bible study I lead. But I began to sense there was more to this study and through the encouragement of a great friend of mine, I began to assemble my notes into book form. The result is this 196 page, 13 chapter book. It is about Psalm 119, but it’s not so much a verse-by-verse study as it is a concept-by-concept, or the term I use is “keys,” I see in Psalm 119 which help us with the rest of Scripture. Here is a paragraph from chapter 1. The book is titled, Our Most Valuable Treasure and is only available via my website, shortbaldguy.com. Go to the “book” page to order a copy. Or just drop me an email at jeff@shortbaldguy.com. I’m asking for $12 for the book, plus it cost me $4 to mail one. But I don’t want the cost to hinder anyone from having a copy. God’s Word is the most important and greatest treasure we have. Invest yourself into His Word. This entry was posted in Bible Application on June 20, 2016 by The Short Bald Guy. I had the privilege of officiating a wedding a few weeks ago. I was honored, humbled, encouraged, and amazed all at the same time. It was an outdoor wedding and while it was slightly warm for a late afternoon in May, the weather cooperated. The bride was beautiful, the groom was handsome (ah, young love! ), the location was picturesque, and it was well attended. It seems all weddings have a minor glitch or two and this one was no different. Due to a light breeze, there was a problem with the unity candles at the beginning of the service but that did not create a major issue. However, just as those words left my mouth, a bigger issue arose as the entry of the flower girl walking down the aisle throwing her rose pedals did not go as planned. While cute as a button, the little 3 year old decided she was not going to participate. Loudly, she made her decision well known. Whether the flower girl walked down the aisle or not, in 20 minutes the couple was going to be pronounced “husband and wife,” so becoming exasperated about this little change of plans didn’t make sense. It served as a relief valve and the rest of the wedding went off without a hitch. Isn’t that how life often works? What we plan for, stress over, and worry about, often has an unanticipated wrinkle thrown at us. What will be our response? Are we going to panic or can we find calmness in the midst of the confusion? Sometimes, the thing that may bring stress into our life can actually be used to help a situation. Take time to enjoy life’s moments. Even if they aren’t exactly what you planned for, if we are “anxious for nothing” and trust Him to work out those events, we can experience the “peace of God” and find contentment in the moment. My guess is, ten years from now, no one will remember anything I said. Most people won’t remember what was served at the reception and only a few people will be able to correctly identify the couples’ colors for the wedding. But, there is a good chance people will remember a cute little girl’s refusal to walk down a make-shift aisle and how nearly everyone in attendance got a great chuckle of her lack of enthusiasm. Has life thrown you an unexpected curve? Don’t be anxious and let the peace of God surround you! Yes it is easier said than done, but trusting Him when plans go awry is the better choice. In the long run, it may even be the best option. This entry was posted in Bible Application on June 10, 2016 by The Short Bald Guy. Recently, I found a great quote which sparked an idea in my mind about how our churches really function. It comes from the Pittsburgh Post-Gazette…. The innovative UPMC surgeon, Dr. Freddie Fu who specializes in arthroscopic knee surgery, talked about advances in sports medicine. (The doctor) recalled the early 1990s when promising Pitt running back Curtis Martin had an ankle injury. (He) helped Martin get an MRI, something new then, and it revealed an injury severe enough to end his season. (He) pointed out that letting the ankle heal properly helped Martin go on to an NFL career that culminated in his recent election to the Pro Football Hall of Fame. As I read this, I thought how often we’ve done that in our churches. We’ve concentrated on the ball and missed the patient. Meaning, we spend quite a bit of time on insignificant or superficial things, but often forget about ministry to the hurting “patients” around us. When I’m saying superficial things, I’m speaking of the fights in our congregation over the colors in the nursery, the layout of the chairs in the auditorium, the dress of the pastor etc. We even get tangled up debating some fine points of doctrine in a non-loving way. And of course there are the “worship wars” over music that many churches face. To the outsider, we don’t very inviting at times. We need to keep our eyes on the patient. Here’s another area we easily fall into, competition with the church down the road. We look at our church and measure ourselves with “them” and miss those hurting around us, the patient, so-to-speak. Keep our eyes on the patient. We need to keep our eyes on the patient, by keeping ourselves firmly grounded on Jesus , and seek out ways to reach those who need the LORD. Presenting His Word in a simple, relevant way that touches their life and speaks to the hurts they have. This entry was posted in Bible Application on June 5, 2016 by The Short Bald Guy.